Alan Au invited me to shoot backgrounds for a movie in March of 2002. It had been my first motion picture assignment in the city since the attack of the year before. I had been there for Paula Zahn’s set photography and printing for CNN’s “American Morning” late in 2001, but this marked my return as a regular translite photographer. Paula began broadcasting live from a wooden platform on the roof of the old CNN headquarters on the morning of 9/11 and the show premiered the next day from the same spot. She went on outside until we finished her set in January and we used the same point of view for her show’s background. 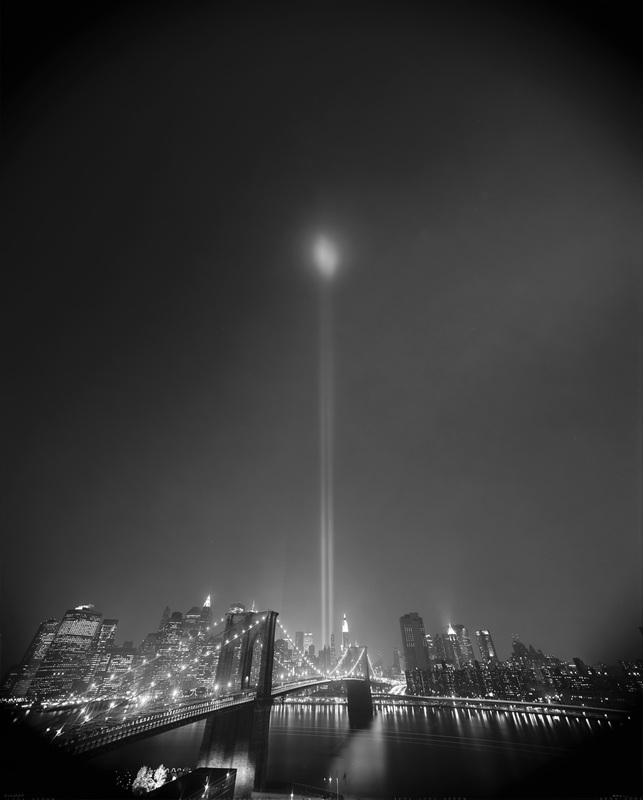 So we had noticed that there were lights on in Lower Manhattan that shot up into the sky. I found out that they were going to be on for a while, so I had to shoot them and retouch later. The story was that they were a symbolic replacement of the twin towers. And they did the job. In total, they were on for a about a month. I also read that they had to be turned off for short periods because birds became confused by them. But when we shot, they remained on. For the translite shot, I was shooting with three 8X10 cameras, creating the pan that I needed. Once I set the day shot up and exposed film, I made it my practice to leave everything in place until after the night shoot was done. We had a bit of rain intermittently, as I recall. But we did finish that night. I had a little film left. So I changed out one camera to a wide angle lens -thinking it was my 90mm Schneider- rotated the back to vertical, and tipped the camera upwards. While view cameras do allow viewing through the lens on the ground glass, I really did not know for sure if I would get the top of the lights until I made a Polaroid. It was clear from that that I had it. And so I shot either one or two sheets. Exposure times at night would often range into more than 10 minutes at full night and I imagine that the whole process took me a half hour or so of extra time to complete. Not a problem for folks who shoot for fun, but I had to keep in mind the time used by the assistant, the location person, and the fee for the building access. Some time later I scanned the negative. From film, a good drum scanner can pick up most of what was captured. It requires interpretation, much like darkroom work did years ago. In time I decided that this image played well as a monochrome. The original color image did not add to the meaning. In that season of my life, I liked to have the sheet film processed in New York. Then I went to a rental darkroom and made my contact prints of the work before I travelled back to Los Angeles where I live. A really laid back guy named Paul owned the darkroom. Wood slat floors and a big bay window made the rental darkroom feel real homey. Guess they are still there on 27th Street. I was close enough to the Indian food part of town to always have some when I did my work. So I had a couple of additional days there. I seem to remember that I had a little time that last night in town. I wanted to visit Ground Zero again, as I had in the months before. But there were two things that were new. One is that the fire was finally out. The first time that I had come out of the subway late in 2011 at Canal Street, the closest I could ride, I smelled it. This memory of that fire is still clear in my mind as I write today. And the other change was that now there had been built a temporary walkway with a viewing platform so that visitors could get a good look. In the previous visit, we walked from Canal to the Church Street fence. We could see some things, but being street level, it was hard to tell really what had happened. The images that stuck with me from that first trip were the homemade posters and pictures put up on the fence. They were memorials to individuals who were lost. And families came. Some had lost someone close. Some had just made a pilgrimage. All were somber. Tears came easily that day to many and they do to me now even today as I write. All had lost their fellows who walked this earth before them. We were mourning together. This was my New York. The favorite subject for my camera. The rich environment of visual roughness, contrasting wealth and poverty. The place where my grandmother had come into the world. The home where she was taken by the Sisters of Charity to play in Central Park while she was at the New York Foundling Home. I believe that she lived at their facility in the East 60’s. Marguerite Madeleine Rice was her birth name. In time, when she reached the age of five, she rode a train to the Dakotas for adoption by the Gauché family. But this City was her birthplace and original home. I went to see the view from the platform that last night in town. When I got there, I found out that I needed to get a ticket. The ticket office was closed. No luck. But I must have had someone looking out for me that night. I went back to the entrance. I hung around for a bit. I talked to the lady cop who was keeping watch. She looked the other way and let me go up. This is what I witnessed. Here we can see the crowd, see the Tribute in Light, and even a small scale model in cardboard of what the Twin Towers were. 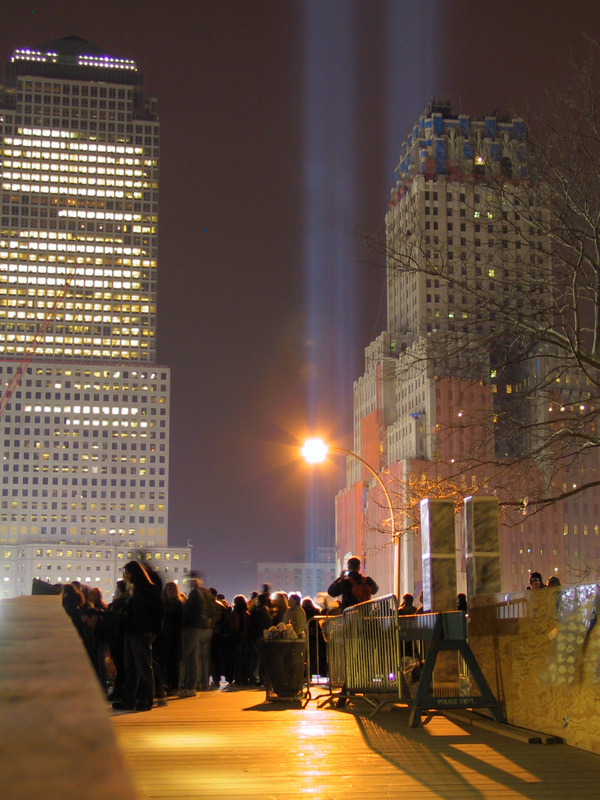 For more on the memorial lights, take a tour of the tribute. I am glad that I saw more remembrances observed this week in New York and elsewhere. I hope that I can always take time to tell children of what happened and why. May we never forget. Let us tell this story as long as we live. It’s our story. This entry was posted in Motion Picture Stories, Personal Anecdotes and tagged 8X10 photography, Alan Au, Anger Management, DUMBO, Ground Zero, New York Foundling, orphan train, Richard Lund, Sisters of Charity, Twin Towers Memorial, viewing platform Ground Zero, Vinyl Backdrops. Bookmark the permalink. Huge enthusiast with this website, several your posts have seriously helped me out. Looking towards news! The slow horse reaches the mill. When I saw this was like wow. Thanks for putting your effort in publishing this blog. I saw something about that subject on TV last night. Nice article.